Note that files must be accessed every 60 days or will be purged. in silico mRNA spike-in to validate transcriptome assembly. Get sample of sequences in FASTA format to simulate reads. These are simulated ‘known’ mRNA fragments floating around in my eppendorf after RNA extraction. For my data, a full lane for each colony ~ 160 million reads. 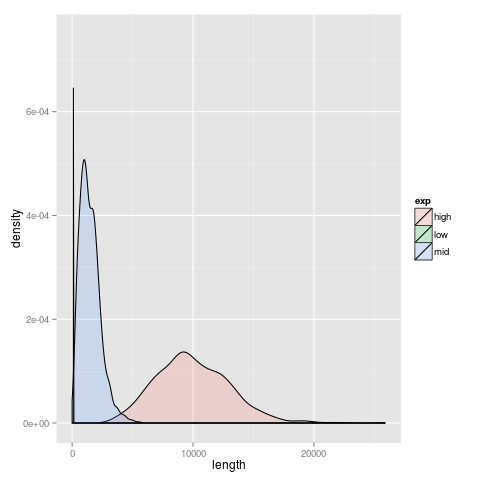 With 17k transcripts expected based on ant genomes and average length of 1k bp per transcript, average coverage should be (160e6*200)/(17e3*1e3) = 1882x. Of course, this will be highly variable due to differences in expression so re-sample expression levels as a gamma distribution centered on this value. For simulated data, don’t need to guess ‘truth’ but should simulate some genes with low expression (~10), some around median (~1500) and some with high expression (~10000). Can then evaluate accuracy of assembly for genes with low, median and high expression levels. sel requires a gamma distribution for expression levels. Following the specification on p11 of the rlsim manual, can specify an equal mix of these distributions by : 1:g:(10, 1) + 1:g:(1500, 3) + 1:g:(10000, 10, ). Based on mean, selected shape parameters by experimentin R. Plot of simulated distribution looks like this . Simulate fragments with default parameters using rlsim. Hmmm…how many fragments to simulate? Seems that efftest is made (partly) for this purpose, but requires paired-end reads mapped to a transcriptome…which I don’t have. Could get this iteratively, by making transcriptome and mapping reads, then using this to make simulated data, then repeating transcriptome assemly including simulated data and evaluate. After running through simNGS the number of reads is equivalent to the number of fragments sampled…which makes sense. So, to decide number of fragments I need to decide how many reads I want. For a transcript of 1000bp at the median coverage of 1800x I would want (1e3 * 1.8e3) / (2 * 100) = 900 fragments. Clearly, I need to evalute if this simulation business works at all given how I’ve set it up. So, set up an independent run of assembly using only simulated data. If this works…proceed. Downloaded first 10,000 fasta mRNA transcripts from European Nucleotide Archive as yesterday. Started knockdown time assays Wednesday 2013-08-13. Will detail protocol soon…. Takes ~4.5 hrs to knockdown assay for a colony with 40 ants. Some concerns about the precision of the assay as it can be difficult to definitively determine when ant is ‘knocked’ down. Decided to record to closest half-minute as this is the accuracy that I feel I have. More git brilliance: use git submodules to include other git repositories within repo. Basic workflow explained on this biostars post.